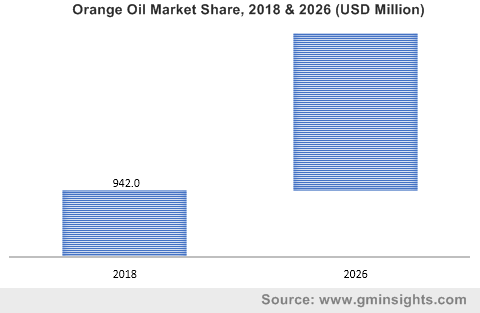 Essential oils Market size is set to surpass USD 13 billion by 2024; according to a new research report by Global Market Insights, Inc. Growing geriatric population suffering with various health ailments and searching for potential herbal treatments to avoid side effects of pharmaceutical chemical drugs will drive aromatherapy industry growth, thereby propelling essential oils market size. Changing standards of living as led to occurrence of various mental issues such as depression, insomnia, anxiety and stress which has grown popularity of aromatherapy. Essential oils such lemon, lavender, sandalwood, jasmine, orange and rosemary oil help in combating these issues which is likely drive market growth. Essential oils play a vital role in treating dermatological issues such as acne, eczema, rashes & hives, psoriasis which makes them suitable for skin care cosmetics, thus stimulating industry growth. Increasing consumer alertness towards synthetic chemicals in the cosmetic products and their harmful effects will surge essential oils demand. Essential oils market size from cleaning & home care application is anticipated to exceed USD 550 million by 2024. Growth in hospitality market along with companies introducing products with additional benefits including germ fighting, better cleaning, fragrance easy to use packs is likely to stimulate product demand in this sector. Growing investments in research to develop microencapsulation for these products to ensure stability and quality to preserve them for flavoring application in beverages is likely to stimulate essential oils demand in this sector. In addition, technology advancement has examined its usage as antioxidant edible packaging film for food & beverage which may foster industry growth. Procurement issues owing to specified storage and transportation conditions required, which is likely to add on cost and challenge industry profitability thereby negatively impacting market price trends. France essential oils market may register gains up to 8.5% by 2024. Occurrence of major cosmetic manufacturing companies has led to increasing imports of these oils in this country, thus propelling product demand. Intensive marketing strategy of companies generating awareness about essential oils and aromatherapy is likely to foster industry growth. India essential oils market will surpass USD 790 million up to 2024. Adoption of sustainable agriculture techniques which has led to large scale production raw materials including spices, lemon, orange, mint for oil extraction will propel industry growth. Lavender oil market size is anticipated to reach over 20 kilo tons by 2024. It helps in combating serious health conditions like cancer, chronic anxiety & stress along with reverse signs of ageing, relieves pain, and headaches which makes it suitable for pharmaceutical, aromatherapy and cosmetic applications, thus driving product demand. Rosemary oil will witness robust growth owing to its wide usage in preventing hair loss, slowing graying of hair, relieving dandruff and moisturizing dry scalp has promoted its use in hair care products. Emerging trends of hair treatments, coloring and climatic conditions damaging the hair growth and leading to varied issue is likely to favor product demand in cosmetic formulations. Global essential oils market share is competitive and moderately fragmented with major companies including Frutarom, Firmnich, BioLandes, DoTerra, Flacon Young Living, Rock Mountain Moksha Lifestyle, Flavex, Florihana, BO International.